Recently I posted this feature looking at a way to combine the various impact measures such as peak career impact, total career impact etc., into one measure using the geometric mean. The geometric mean allows us to bring together various parameters of different magnitudes to give a single number. I was surprised, after doing this, to find that Greg Matthews figured quite highly, in fact he was as high as 119th of all-time. Considering that there have been almost 2800 cricketers awarded their Test caps, this is quite an achievement for someone who I had frankly overlooked as an impactful player. In fact, he is in the top 5% all-time in terms of impact. “Mo” had a somewhat fractured career, being overlooked for four years after the 1986-87 Ashes, however he certainly made an impact on the great Steve Waugh, who considered him to be a player “who could play better than he probably ever realised”. Matthews averaged over 53 with the bat during that 86-87 Ashes series, however 2/295 with the ball was enough, along with his “out there” image, to see him cast aside for Peter Taylor. Solid seasons for New South Wales over the next four years, where he averaged 36.46 with the bat (four hundreds) and 28.56 with the ball (137 wickets), saw him recalled for the 1990-91 Ashes Test in Brisbane. However, he again proved to be far more successful with the bat, averaging over 70 for the series but with only seven wickets at 60. So how can he fare so well in terms of the impact measure? Using the traditional measure for all-rounders of the difference between batting average and bowling average, as can be seen Macartney is streets ahead, +14.23 as against -7.14 for Matthews. However, there are two things we need to take into account which were different for each player – quality of opposition, and era. Some time ago I determined the ICC Test team ratings for all Test teams going back to 1876-77, and close inspection of each player’s opponents shows that Macartney went up against teams which rated on average 92, whereas Matthews had to take on opponents which rated 110. The average team, i.e. one which wins around as many as it loses, rates at around 100, so we can use that average team rate to adjust each player’s figures to account for strength of opponent. Matthews faced opponents with a rating of more than 100 on 21 occasions in 33 matches, or 64% of the time; Macartney faced similar strength opposition only eight times in 35 matches, or 23% of the time – this is significant and should be accounted for. Their all-round ability as measured by batting and bowling averages is now much closer. Now, I’m not saying that Matthews is basically the same quality player as Macartney, as quality is measured in many different ways, including style, leadership, etc. and usually takes into account the type of man they are; all I’m saying is that the gap between them is not necessarily as large as their traditional averages would have us believe, once those averages are put into perspective. In terms of impact, we can compare the two players in terms of their impact measures by career as well as per match. We can see from the above figures that Macartney was more consistently impactful, but that Matthews had more high-impact matches. It will come as no surprise that Matthew’s most impactful match was of course the Tied Test, when he took his only ten-wicket haul, including the vital last wicket which ensured Australia did not lose. 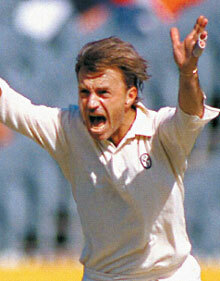 Matthews also played a key role on his return to the side in the 1990-91 Ashes, including a four-hour 128 with 17 fours to guide Australia from 292/5 to 512/9, though his bowling was once again expensive. Fine performances against Sri Lanka preceeded his swansong against the mighty West Indies, such that his final innings in Test cricket, 79, was overshadowed by his expensive bowling (2/169) and Brian Lara’s maiden century of 277. Apparently miscast as a bowling all-rounder, his batting was not as much of a necessity to the Australian side at that time and he was not selected again for Tests. It’s also worth noting that if Ian Botham had retired after 75 Tests, he would have ranked behind only Bradman with 46.67% (35 in 75 Tests). 41 players who amassed at least 25 high-impact matches, i.e. 20% or more in impact, and quite a list of all-time greats it is too. There are some interesting clusters there:- Murali, Warne and Kumble all within one, while Botham, Kapil Dev, Hadlee and Imran are all within positions 11-15. It is the desire to be fair both to players of past and present which led me to using the geometric mean to take into account the various methods of ranking based on impact. Next time I’ll post the best ever teams in terms of impacts.